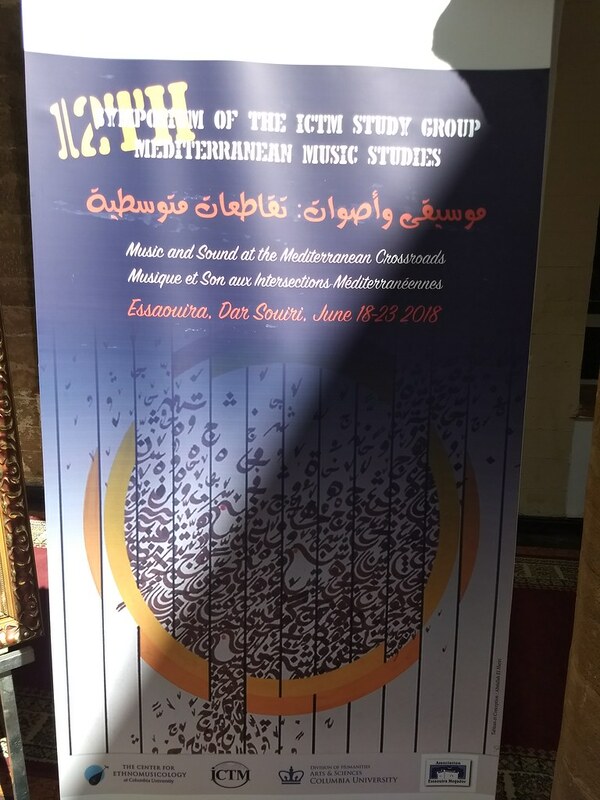 On our second day in Essaouira, the ICTM Mediterranean Music working group’s conference began, and I attended for maybe about half the day. This was the real impetus for us coming to Morocco to begin with. 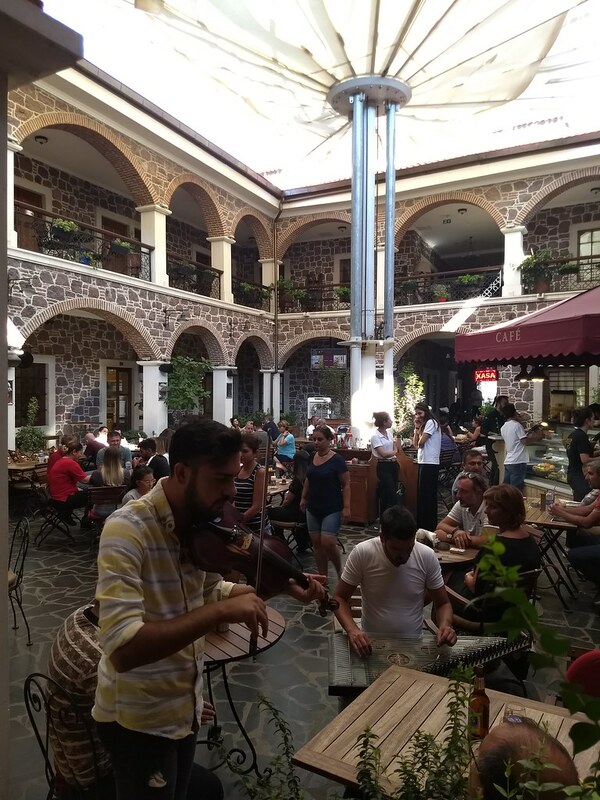 It seems a good group, a very cool conference, to bring together some 70 people or whatever the number is who are all specialists in Mediterranean music (Andalusian, North African, Sephardic, Greek, Arab, or Ottoman), to such a special location, to discuss such topics. Makes me eager to try to attend their East Asia working group’s conference sometime. Though it’s recently been in Seoul, Taipei, Nara, Hong Kong, and Shanghai, I wonder if they might ever hold it in Naha, Nagasaki, Tsushima, Fuzhou, Hoi An, or somewhere else that might provide me an opportunity to go somewhere really special I haven’t gotten to go to otherwise. The harbor at Essaouira. Many of the fishing boats are painted blue, in keeping with the color scheme of the city. In any case, while the conference was going on, I ducked out a few times, once to retrieve my camera from the Supratours bus company office as I had accidentally left it on the bus the day before, and once to just make sure I explored the key historical sites of the city. It’s a small city, and though it has many gates and city walls, and who knows maybe spots of historical note otherwise that I’m not quite aware of (apparently Jimi Hendrix spent quite some time in a hippie colony / Berber village just down the road, called Diabat), it seems the only thing of really major note is the Scala – a set of fortifications right at the port. 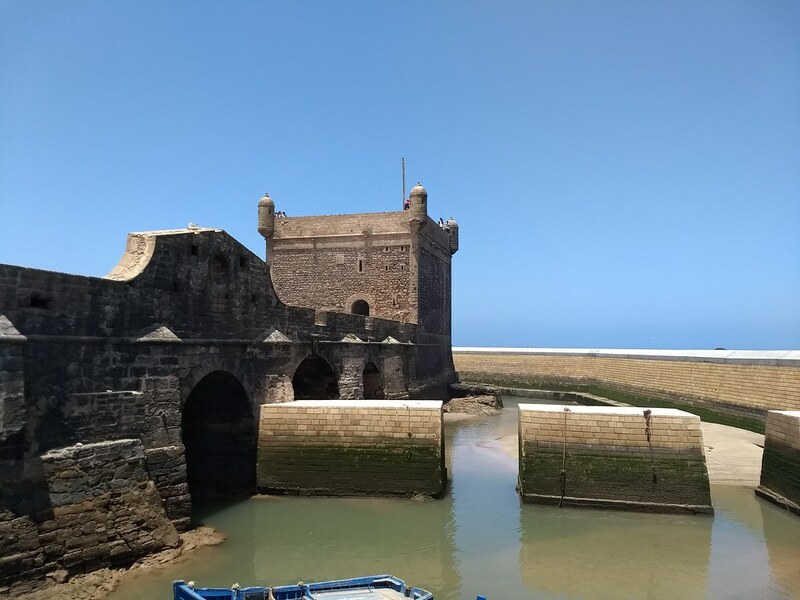 Built by the Portuguese, the Scala played a key role in defending the tiny Portuguese settlement here from Moroccan raiders and the like, and with Essaouira (then called Mogador) as a base of operations for Portuguese exploration, raiding and so forth, and trade. As we’ll remember from our survey of world history classes, the Portuguese Empire, at least in its early centuries, was never one of conquering large swaths of land, but rather was all about establishing small trading posts: Mogador and the nearby Madeira Islands in Morocco (the latter still controlled by Portugal today), Goa in India, Macao in China, and various other spots along the African coasts. From their base in Mogador, the Portuguese traded with Madeira and elsewhere, and raided nearby (and not so nearby) African villages and towns. The ruins of a fortress on a tiny island just offshore from Essaouira. 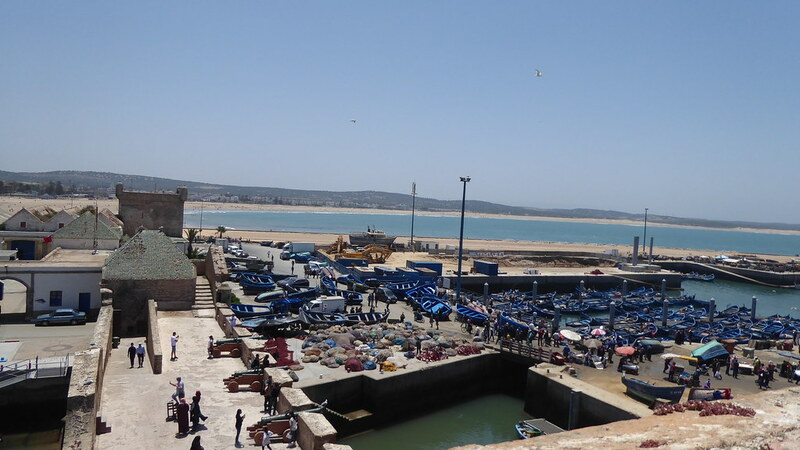 The city of Essaouira, we are told, really came about only after the Moroccans took back the area from the Portuguese, and a sultan named Sidi Mohammed ben Abhallah oversaw the establishment and expansion of the city. But the fortifications survive. In terms of how long it takes to walk around and see them as a historical/tourist site, they’re small – it took me literally 15 minutes to see them, including the time it took to walk from and then back to the conference venue – but they’re pretty cool. From the Scala, you can get some just gorgeous views of the city and the sea, of the ruins of a small fortress on a tiny island just barely offshore, and of the fishing boats, many of them painted a brilliant blue. The squarish towers seem iconic of a particular style and period – perhaps they’re typical for 15th-16th century Portuguese architecture? – and the cannon still lined up all along the walkway evoke that for us. I wonder, if we went to sites in Ghana and elsewhere in West Africa, perhaps we’d see very much the same sort of thing – evoking a particular aesthetic, a particular imagined idea, of Portuguese empire in Africa. A space that is decidedly European, but also distinctive of that particular period, those particular developments, that particular set of phenomena, of 15th-16th (or 17th, 18th…) coastal fortifications and (slave) trading posts in West Africa. 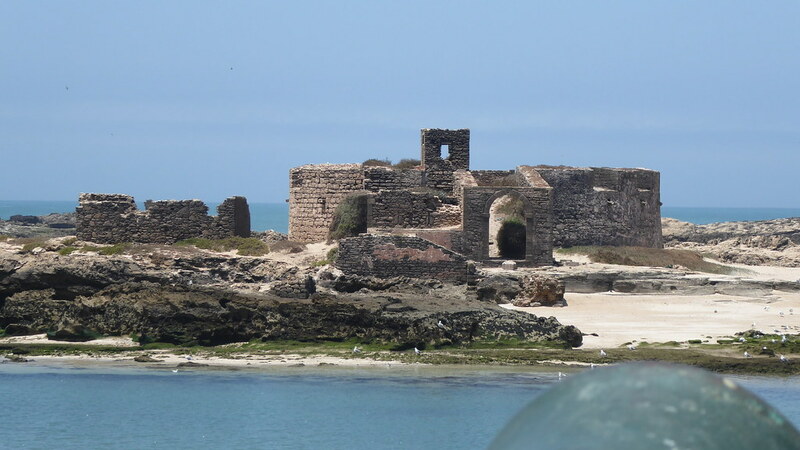 Above: a section of the Portuguese fortifications at Mogador (Essaouira). Photo my own. 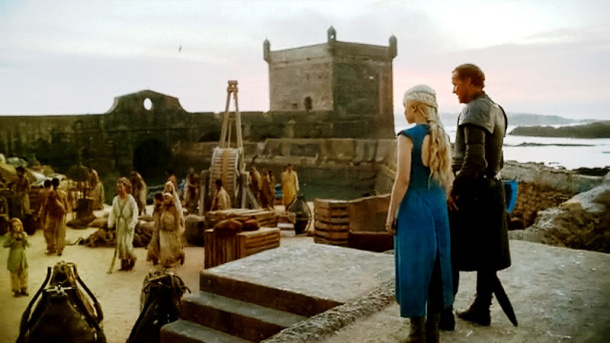 // Below: a scene from HBO’s “Game of Thrones” TV show, in which the site is used as the scene for “Slaver’s Bay” or Astapor. 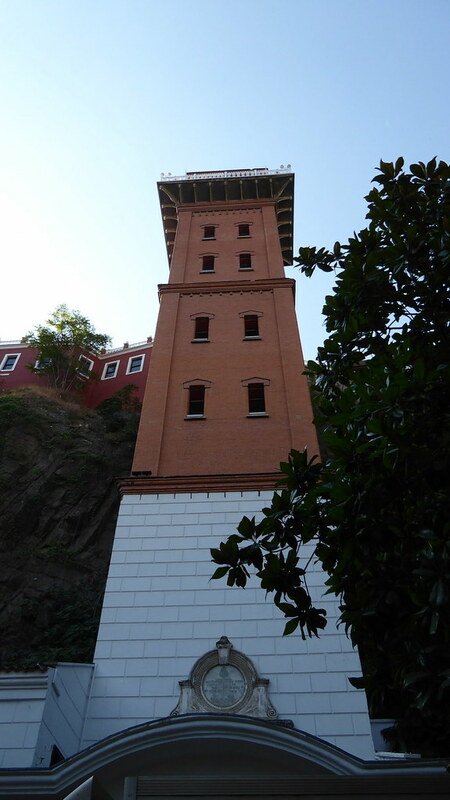 Of course, I was also excited about the Scala as it was a shooting location for Game of Thrones. Seems a bit weird that I should get to see this tiny piece of Astapor of all places – and not King’s Landing or some other more central or major site from the show – but it is what it is. And once you see the screenshots, it’s so recognizable. 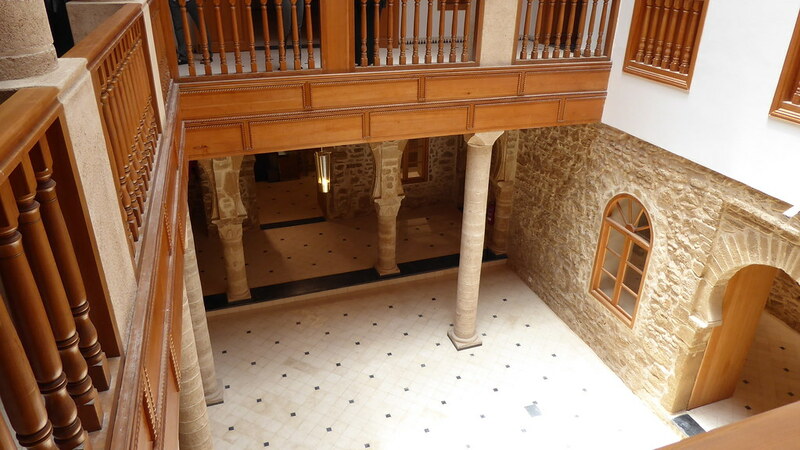 Above: the “Walk of Punishment” in Game of Thrones. 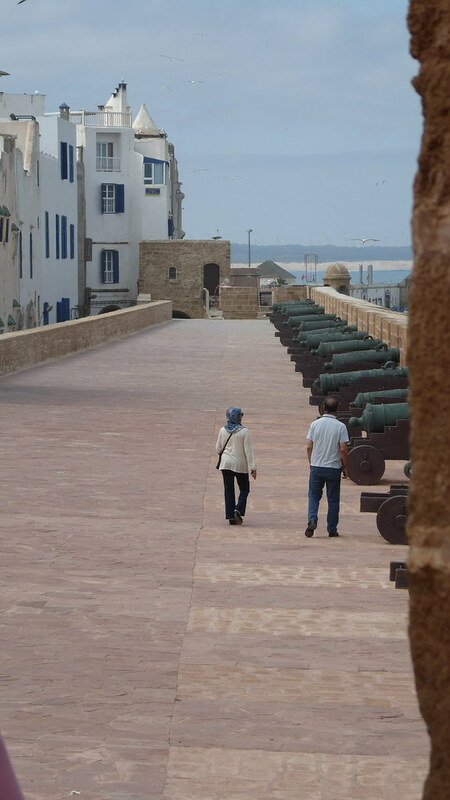 // Right: a section of the city walls of Essaouira. Photo my own. I do wish they had more (or any) plaques explaining the history of the site. Thankfully, Wikipedia and various travel blogs and the like filled me in, and one of the last conference presentations of the first day gave a very nice overview of the history of the city for us as well. 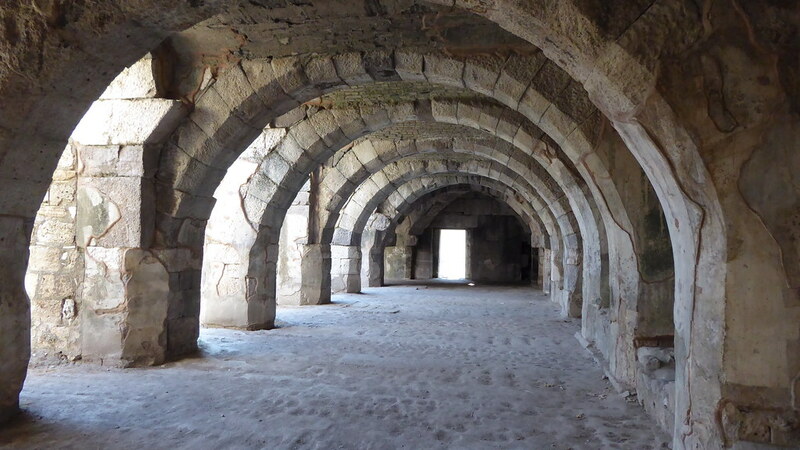 The next day, I made my way to the other end of the fortress complex – while the Scala is prominently visible at one end of the beach, and on tourist guides, and charges 10 dirhams entrance fee, this other site has none of that. But it’s otherwise fairly similar – and it was this site, I believe, that was actually the one where they filmed the Walk of Punishment. So that was a very nice find. Great views of the city once again. Looking down into Essaouira’s chief synagogue. In the afternoon, everyone from the conference got taken on a tour of Essaouira’s small Mellah by André Azoulay. He first pointed out that a gate we’ve passed by numerous times in fact features a circle of a Koran verse at the keystone (center, just above the arch), flanked by two Stars of David. Though the six-pointed star is a natural design to emerge out of pure geometric experimentation, and does in fact feature frequently in Islamic tiling designs, here he says it is definitely a symbol of Essaouira’s Jewish history. 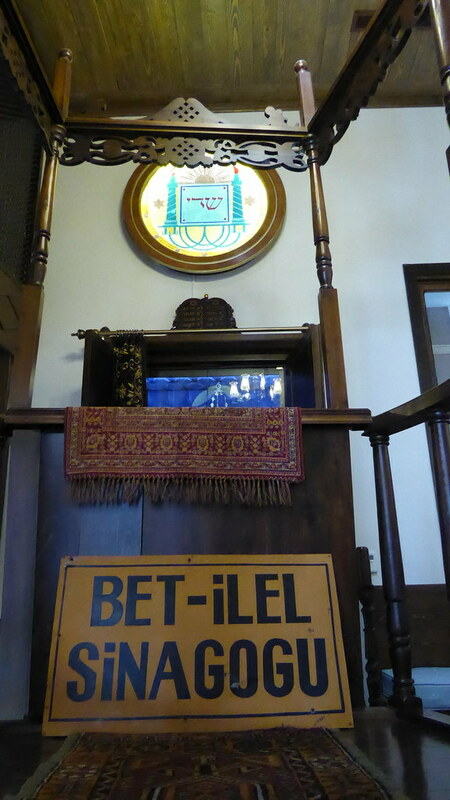 He then took us to the community’s very small synagogue, which was a pleasure to see. Sadly, the explanation was given largely in French, so I didn’t catch very much of it at all. But, attached to the synagogue, they are just now completing construction of a “House of Memory” – essentially a museum of the Jewish community in the city, though they don’t call it a museum because apparently Azoulay, and I suppose others, feel that museums represent a culture that’s in the past, whereas they wish to focus on the future. 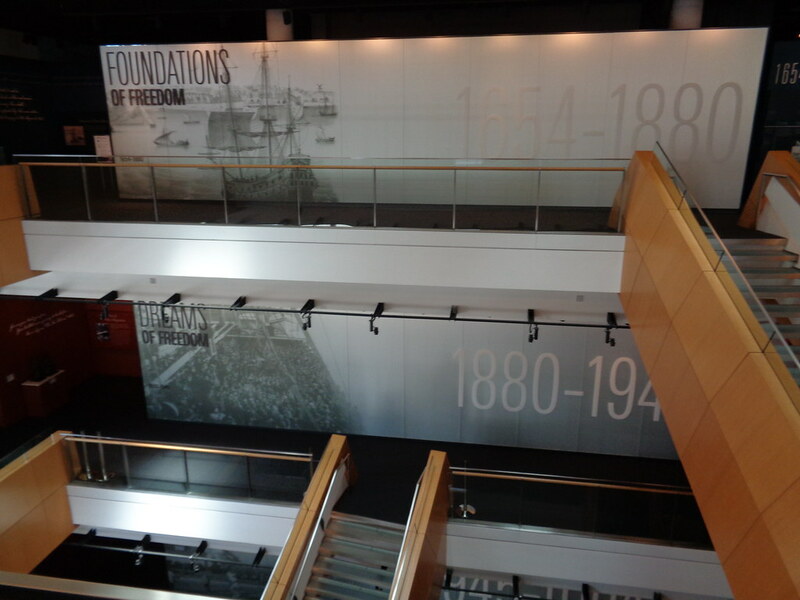 In addition to exhibits, the Memory House will provide some sort of spaces and resources for research. 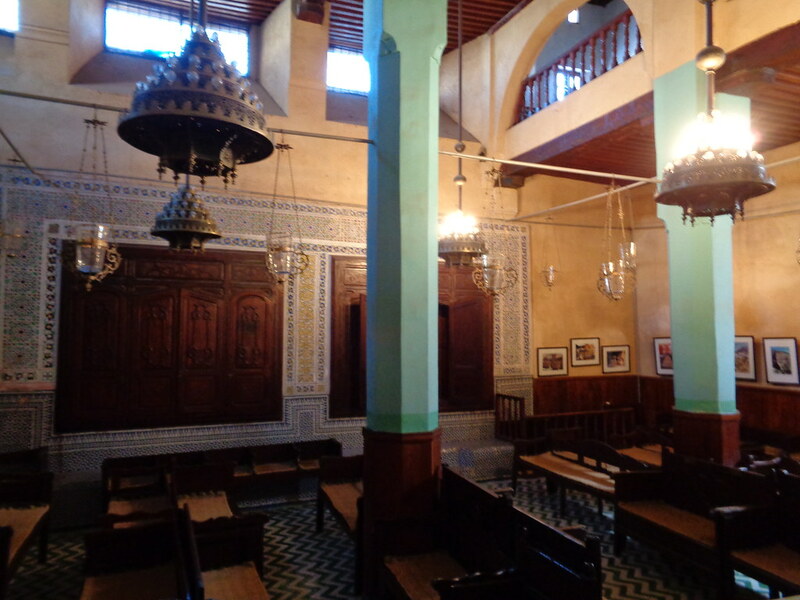 Dar Souiri, home of the Essaouira-Mogador Association, where the conference was held, also has a nice library of books on local history, and on Judeo-Muslim-Christian relations. I imagine that for someone doing research on just the right topic, these two institutions could be just perfect homes for them during research trips. The House of Memory being constructed as a museum of the Jewish history and ongoing community of Essaouira. Azoulay also told us that one of the writers of the very first US Constitution was a Jew from Essaouira, though I didn’t catch his name. 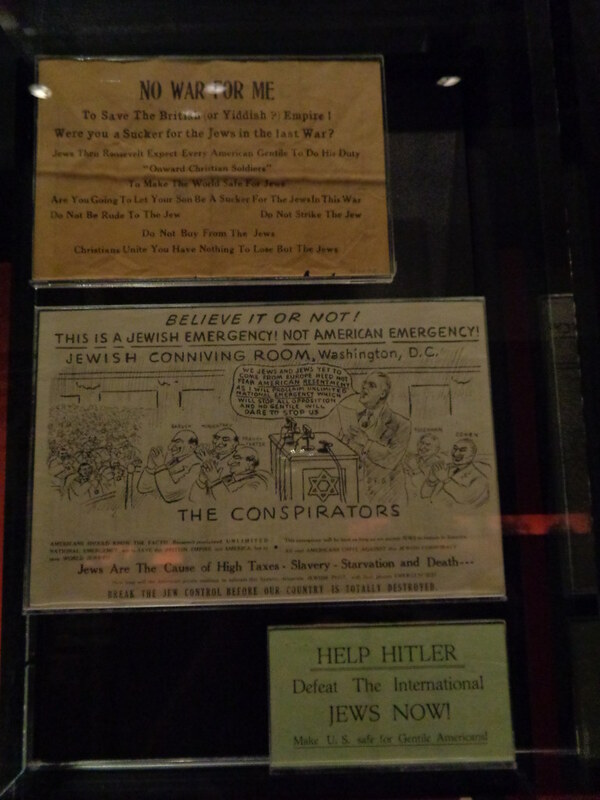 He was the first Jew elected to office in the US. He donated his land to what is now the University of Florida. His father wrote a very early anti-slavery treatise. If anyone can tell me the name of this figure, I’d appreciate it. We learned that a notable UK Minister of Defense & of Transport of the earlier 20th century was also an Essaouira Jew named Belisha. After a simple dinner, we finished out the night with a conversation with this incredible eccentric woman who it seems practically lives here quite frequently, though only for a few weeks or months at a time. She wouldn’t let me take a photo of her, which is a shame because she just seems such an incredible woman and I wanted to document in that way having met her and who she was. But, words shall have to suffice. A thin woman with wild white hair, an elegant blue and white scarf, and long black jacket or robe which made her seem larger than she was. Thin, a bit up in years, but so full of life and energy, and someone who just truly radiated presence. She said others have often described her as the woman of the house (madame d’ l’ mansion? I forget the French), and it certainly sounds like she has a special relationship with the proprietors or staff everywhere she goes. But, it’s funny. My first impression was simply of a cosmopolitan world-traveler who truly enjoys her retirement, in relaxing fashion. Then we learned of her multiple PhDs, her various forms of volunteer work in Kenya and elsewhere, even leaving her home in a major US city, for a time at one point, unlocked and open at any hour for the police to direct abused women to go there and have somewhere to be. Degrees in agriculture, storage technologies, etc., and experience advising governments and similar institutions around the world in agriculture, storage, education, medicine, all sorts of things. I forget if she said she was ever officially affiliated with the UN or only with other organizations, but definitely with organizations of that sort, at least at times. Makes her seem like someone truly of note, like she should appear in Google searches. It’s truly amazing the kind of people you meet sometimes when you travel. With the exception of screenshots from Game of Thrones, all photos are my own. 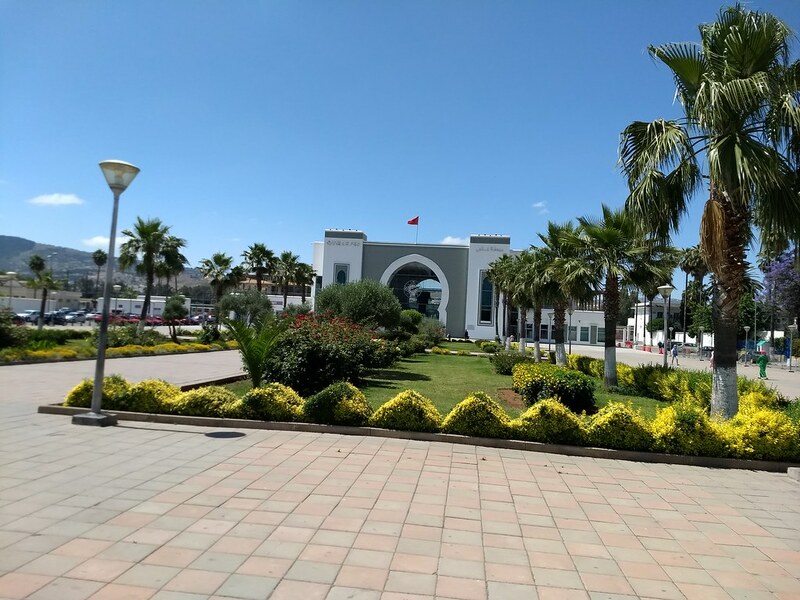 On our third day in Fez, we first left the medina and went out to the train station, to make sure we booked our tickets to Marrakesh sufficiently early. The train station, like the airport, looks really new and clean and shiny. Actually, here and there all throughout the city we saw various buildings which looked super new and clean and shiny, in stark contrast to everything else around them. Some were labeled “International Agency for Human Development” or something like that; others, such as an old caravanserai, we were told were renovated at the expense of the King. 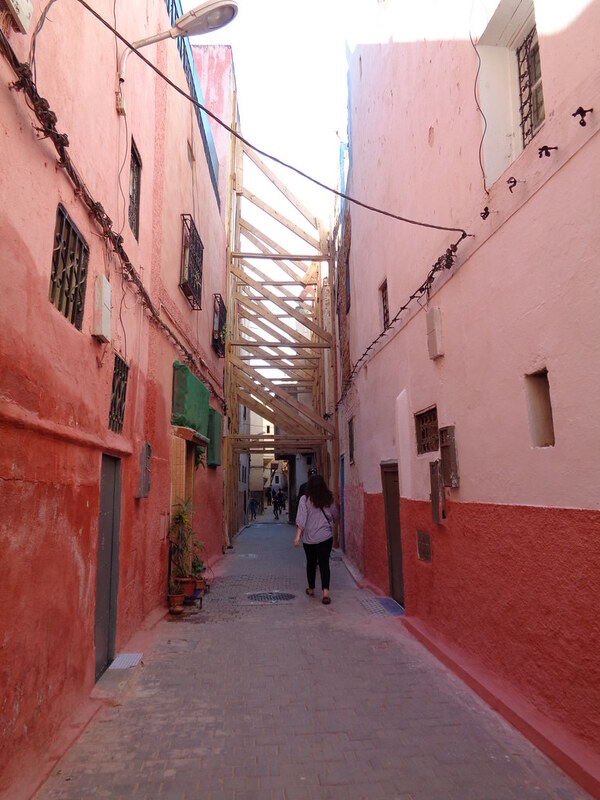 But, in any case, after the train station, we went to a district called the Mellah, about a 20 minute walk just southwest of the Medina, which was once upon a time the Jewish quarter. There, a kind man in his late 20s named Abdul Assif, offered to show us around. And he really did a very kind job of it. Didn’t lead us too far astray, or pressure us to buy anything. 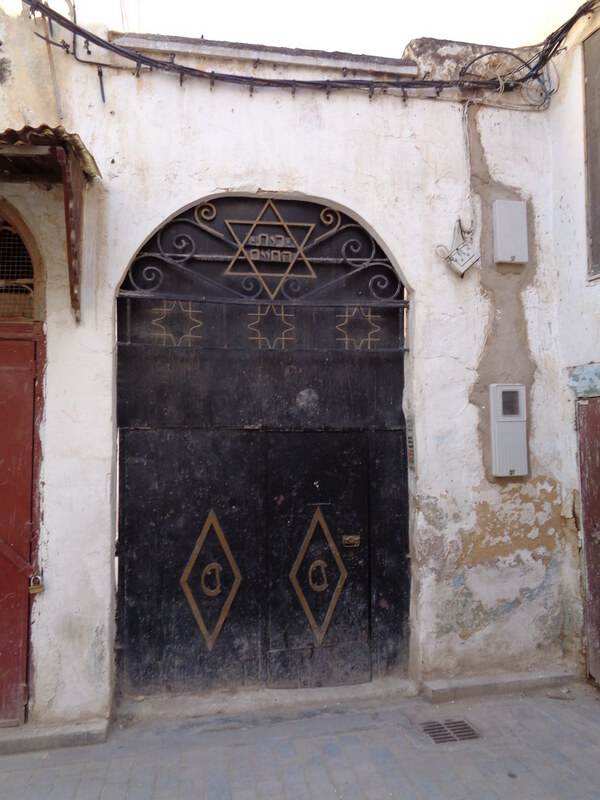 Just genuinely showed us various markings and sights, including the rabbis’ houses, and some markings of horseshoes, stars, and hamsa over doors or windows which he claimed marked the former homes of Jewish artisans. I’m not sure I buy it. But, still, he then also showed us the gates to the Jewish cemetery, labeled “Beit Ha Chaim,” or “House of Life” in Hebrew, a very typical name for a Jewish cemetery. 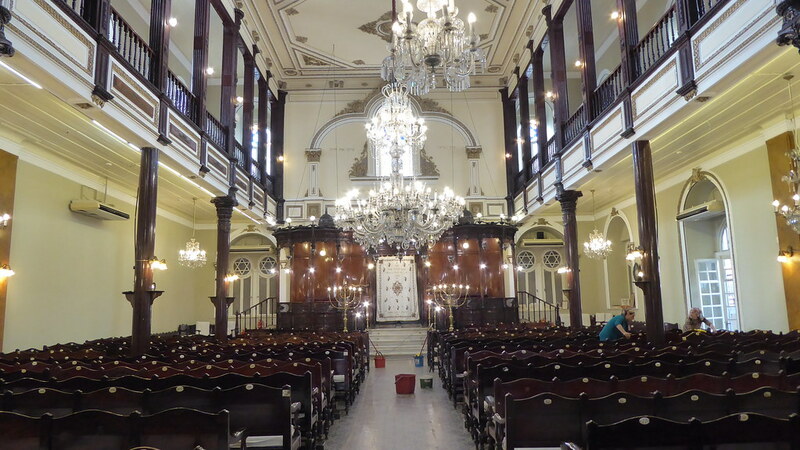 And finally he led us to what we were really looking for – Ibn Danan, a 17th century synagogue that’s no longer in operation but is maintained as a historical site. 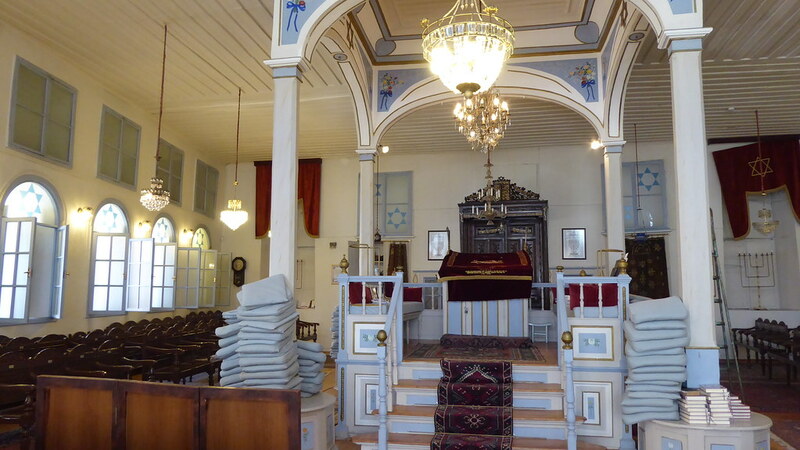 Nothing too exceptionally special on the inside, looking quite similar to ones I’ve seen in Tsfat (Safed) and elsewhere, but still very very cool to see – a synagogue, in Morocco!, in that particular traditional style where the pews face no particular direction, and the bimah (pulpit) is its own tiny little box with a pointed roof over it, looking quite a bit more like counterparts in Catholic and Muslim traditions, rather than the larger simpler stage and lectern that we see so often in the West (or, at least, almost ubiquitously in the US). As we expected to hear, the men would pray in the main room downstairs, and the women in a little balcony upstairs. There was also a tiny ritual bath (mikva) in the basement. And from the roof, we could see the cemetery. 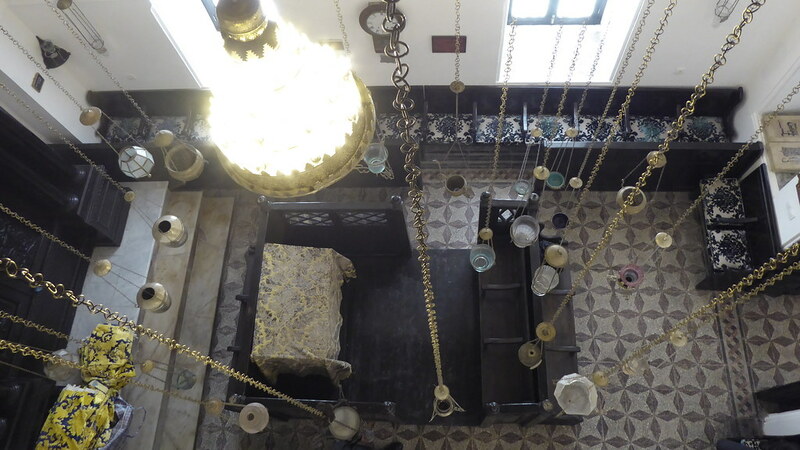 I don’t know anything about Moroccan Jewry – the synagogue itself looked very similar to things I’ve seen elsewhere, Sephardic or Mizrahi traditions, with some elements, such as the hanging lamps, clearly quite similar to Muslim aesthetic styles. 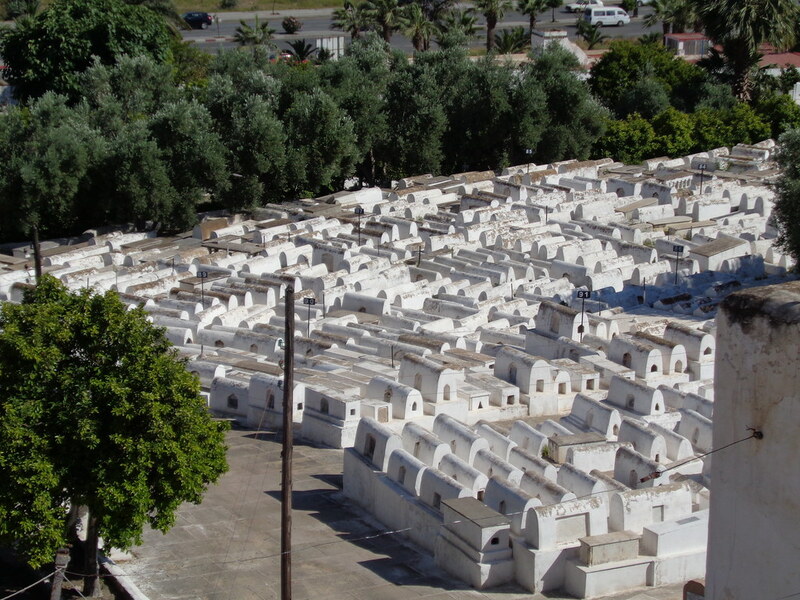 But as for the rows and rows of perfectly white tombs, that’s new to me. I wonder where I might be able to learn a little more about that. After the synagogue, Abdul Assif led us to his friend’s shop, who sells just about everything from shoes and leather bags to argan oil and other health products to rugs and ceramics. The argan oil was quite cheap, and the guy kept going on about how his prices were so much cheaper than in the Medina, because he sells wholesale to Moroccans – not usually to tourists – but then in the end he still charged us something like 280 dirhams ($28) for a cup or bowl! So, we kind of got taken in. Oh well. But, Abdul Assif then led us back to the gates of the medina, and was really quite kind and good as he let us go. No further pressure or anything. 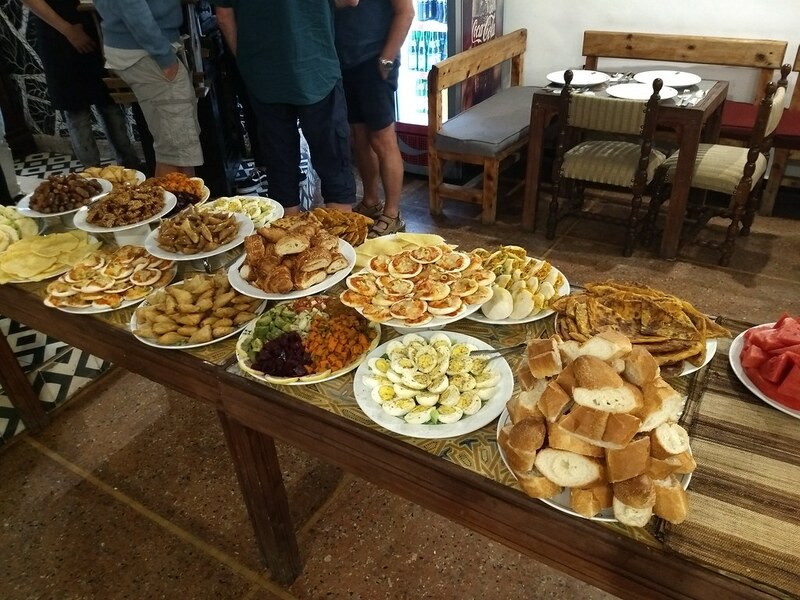 We then made our way back into the medina, and had dinner that night at a place called Cinema Café, where they offered a special break-fast buffet. It was mostly tourists, so I felt a little weird about that – people have been fasting all day, and are eager for their traditional (or, in this case, at a café, maybe not quite so traditional) break-fast dinner with friends or family, and yet here we are, as tourists, pretending at joining in the same sort of religious or cultural custom. I think if we were Muslims visiting into town, who didn’t have any friends’ or family’s home to break fast at, that might feel more to the point to me. Like when I myself am overseas and am happy to find somewhere to celebrate Thanksgiving or Hannukah or whatever with others. Still, anyway, we did this thing, and both the food and the atmosphere were quite good. Cinema Café and another place we went to numerous times, Café Clock, are hip little oases of the kind of “hip” “modern” “cosmopolitan” sort of places one might expect to find anywhere else in the world. Feels a bit more like London, New York, or Tokyo than one might think or expect of Fes – which isn’t to say, of course, that Fes isn’t allowed to be modern, worldly, cosmopolitan, but hopefully you follow my meaning. Café Clock is a funny place. On the one hand, it sort of feels like the hip sort of place that cosmopolitan young Moroccans might hang out in, a place that works really well as a “third place,” to go to regularly, to have a coffee or smoothie and (use the wifi and outlets and) work, or just hang out. Certainly the staff, many of whom seem like they’ve probably gone to school in Europe or elsewhere, seem to have that air of having the space serve that for them. But, then, on the other hand, it also feels really touristy in certain ways, like you’re doing a bad tourist, bad expat thing by “escaping” to this more comfortable place, which is cleaner and nicer, a bit more upscale… They have cooking classes, film screenings, music performances and music lessons, and other cultural events all the time, which is really great, but then also, makes it again feel more touristy. So I’m not sure what to think, except that we enjoyed it, and I’m glad it was there, and I’m not going to feel sorry or embarrassed about enjoying it. They had excellent smoothies and other things on the menu, a beautiful rooftop terrace with a view out over the neighborhood, a slightly quieter/cozier downstairs area with tables where I just worked on my computer while my gf had a private one-on-one oud lesson.. and the best wifi we’ve yet found in Morocco – much faster than in the guesthouse, allowing me to upload and email photos to my father, etc. We went back to Café Clock I don’t know how many times, for oud performances – my gf got to join in and play for one of them – for break-fast buffets twice, for getting a little work done, and for just having tea and sweets late at night. I also tried their camel burger. I’m glad I did, just as something I can say that I’ve tried, but frankly it was pretty gross. But then again, this is the first meat I’ve had in many many months, and I’ve never really been into burgers or steaks to begin with. So who knows if it was actually prepared badly, or actually all that bad-tasting, but it just wasn’t for me. As I think I mentioned, in Fes, not only do people constantly call out to you to come look at their wares, and then haggle with you over the price, and make it hard for you to leave, but people will also constantly come up to you asking where you’re going, and offering to help guide you there – then take you around and around, intentionally getting you lost to make you feel like you really did need their help (and will need their help getting back, so you can’t leave! )… they take you to their friends’ places and try to push you into buying things, and then at the end demand some kind of fee for their help. … Simone is quite good at haggling, but even so we both were taken in a few times. Thankfully, we were lucky, nothing too horrible ever happened to us at all. We got tricked or pressured a few times into buying things that were much more expensive than we’d expected – for example, a 28 Euro bowl that we’d expected would be closer to something like 70 dirhams (7 euros), given the expectation that everything ought to be much cheaper in Morocco, and that it almost undoubtedly *is* much cheaper, for Moroccans, just not for tourists; and for example taxi rides where they refused to use the meter, and then at the very end tacked on an arbitrary additional amount, say 30 or 50 dirhams, for the bother of loading and unloading our luggage. … That’s about all. Really the worst was just that a couple of kids (mid-to-late 20s) offered us tea and hash, and got us sitting and talking for a long time, and then led us around and around and around the winding roads of the medina for at least an hour, maybe two, I don’t know, at like midnight, offering to show us all sorts of key sights but really showing us pretty much nothing, and then we made the mistake of arranging to meet them the following morning so they could show us around again, and made the mistake of telling them where we were staying. Such that the following morning, even after we decided we were sketched out, and would just ditch them by staying in our room and just not answering the door, they waited for us for *two hours* and then cornered us when we finally did leave our guesthouse. Fortunately, again, though we were a bit scared and turned off by the whole thing, scared they might follow us, or just keep showing up demanding more money, or bring more friends to – I don’t know what, actually turn to physical violence? – fortunately, once we were firm and just told them we were done, and to go away, nothing more came of it. 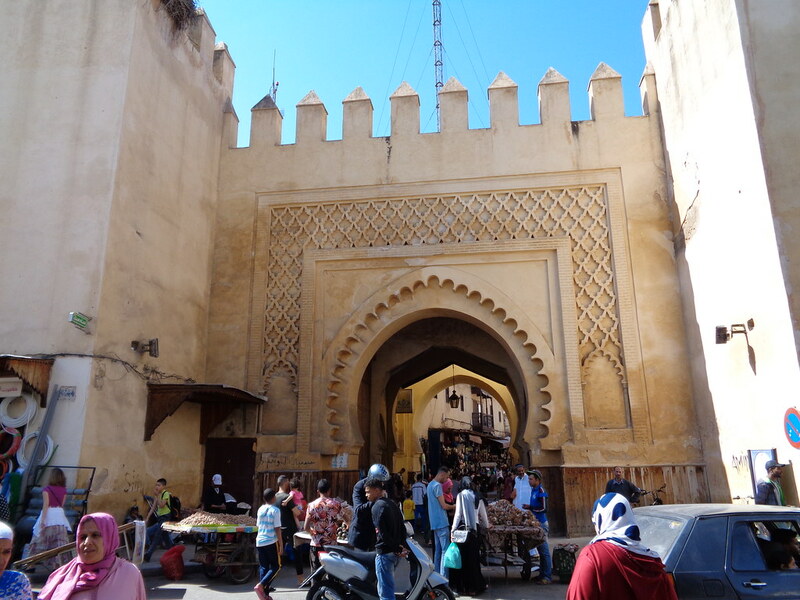 Bab Semmarine, one of the main city gates out by the Mellah (Jewish quarter), about a 20 minute walk from the medina. But, with that experience under our belts, by the time we got to Marrakesh, we were really on our guard. As we left the train station, none of the taxi drivers were willing to use the meter; all cited numbers we thought were probably too expensive. And then they started actually yelling and arguing with one another over who was going to get to take us… We eventually just got into one, just to get it over with and get away from there. Then, when our cab finally stopped somewhere, and people just started taking our bags out of his cab, our first reaction was, where are we, who are these guys, what’s going on? For all we know, this cab driver could have been a scammer, who had brought us to his friends who were going to steal our stuff. Or something. Or, if not quite so bad, even still, maybe these guys were just random touts who were going to insist on “helping” us to our guesthouse, maybe even guiding us some excessively roundabout way, and then demand a tip. So we both said, hey, I don’t know who you are, we don’t need your help, we’ll be fine. I was actually a little bit scared. Having to defend yourself like that, and protect all your possessions when you’re outnumbered and don’t know where you are and have so many bags to manage… But then the lead guy – who is a young man, maybe late 20s, dressed in cut-up jeans and otherwise just looking like one of these street touts – pulled out a card showing he was with the guesthouse, so we decided, okay, I guess we should go with him. … This of course made the rest of our stay awkward, since we’d so distrusted him, and now he’s our host for however many nights. But, so it goes sometimes, I guess. If it happened all over again, I’m not sure I’d react any differently. 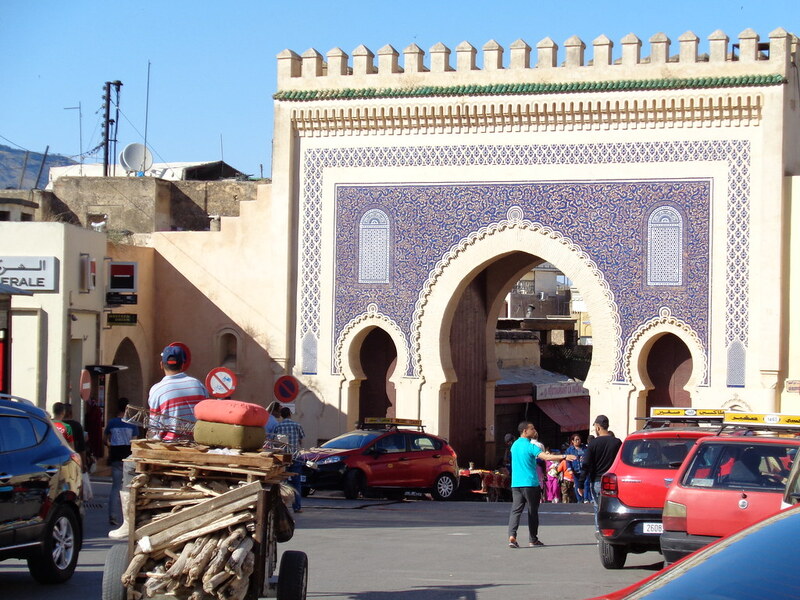 Bab Boujloud, the “Blue Gate.” The main gate into the medina of Fes. Between this Morocco trip, and our time in Israel, Turkey, and Greece last year, I really have to say this whole street market culture of harassment, haggling, and scams is really one of my least favorite aspects of travelling in the Middle East. Maybe it’s just a cultural thing, as an American, I have different expectations and values and desires, but, I just really hate being forced by the situation to constantly, constantly, have to be impolite to people just to get them to leave you alone, or to treat you fairly. I hate having to assume that all the shopkeepers are constantly lying about the quality of their product, and about the price, constantly having to second-guess whether they’re being nice out of genuine kindness or as part of a method to get your money. Even in a “tough” city like New York, when you tell people to leave you alone, they generally do. But here, people will follow you for a block or more, still trying to haggle to try to sell you something even after you’ve said no. They’ll show you a dozen different versions of something even after you’ve firmly established that they don’t have the right color, style, size, or price for what you’re looking for. You can’t even look at something in the market streets, even glance in the direction of a shop or mouth the words “hey, that’s kind of nice,” without someone showing up to try to encourage you into their shop, sometimes even physically grabbing you or physically shoving the product into your hands. I hate that when you say No, they keep pressing. There’s really no way to get people to go away except to say No over and over and over again, and to just keep walking. There’s no way to deal with the constant calls of “Hello,” “Where are you from?,” “why don’t you just take a look?,” “very good prices, very good products, for you,” except to finally just ignore them entirely. And it’s not ignoring in a neutral sort of way, like how you ignore shop calls in Japan and they don’t care because it’s perfectly normal – here, people treat it like you’re being rude to them, even though that’s exactly what’s necessary in order to get them to leave you alone. On the plus side, though, I guess I’m getting more used to it. I’m still taken in a lot, but it’s certainly less shocking, less aggravating, than it was last year. One travel tips website actually said that market touts in Fes and Marrakech are less pushy and so forth than in Istanbul or elsewhere in the region; I’m not sure this is true, but … whatever. You learn and you deal and you move on. 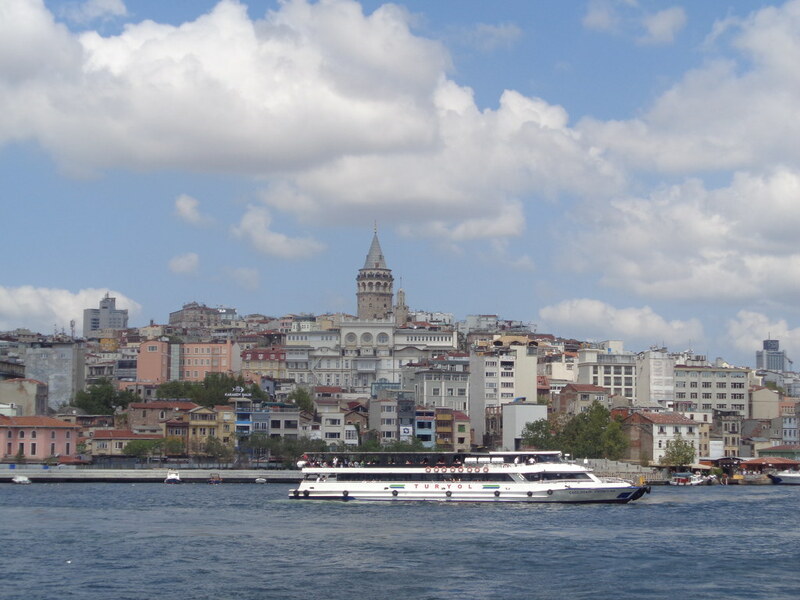 The Istanbul skyline, with the 15th c. Galata Tower in the center. For these whole five or six days in Istanbul, I’ve been mulling over what my impressions of the city are. Is Istanbul a European city? Or an Asian/Middle Eastern city? A secular city, or a fairly orthodox/religious theocratic city where I need to be concerned about accidentally offending? A relatively free and safe city, or should I be worried about the recent coup, protests, and creeping authoritarianism? Further, thinking historically, should I be looking around and thinking about the medieval/early modern Ottoman city? the Byzantine Eastern Roman one? 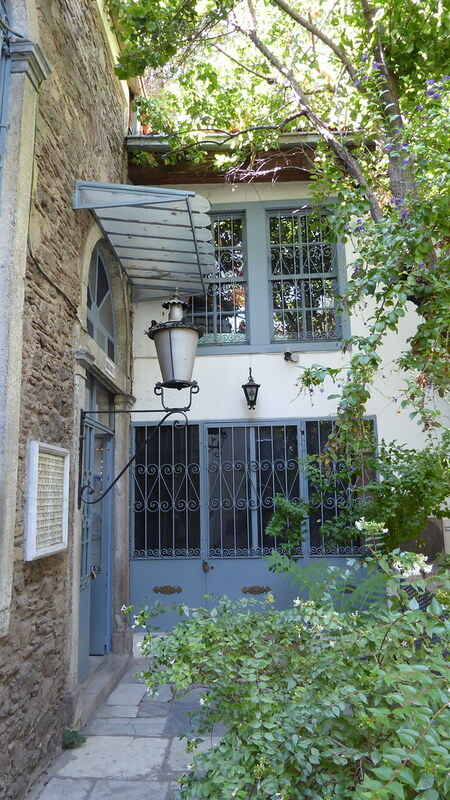 late 19th or early 20th century Ottoman modernity? There are certainly plenty of buildings and monuments from across history to remind us of each of these periods, each of these aesthetics. Sadly, there was some sort of conservation work going on in the Hagia Sophia when we visited, and half of it was off-limits. The Roman and Eastern Roman is seen everywhere, well, at least in the historical/tourist center of the city, the Sultanahmet area. 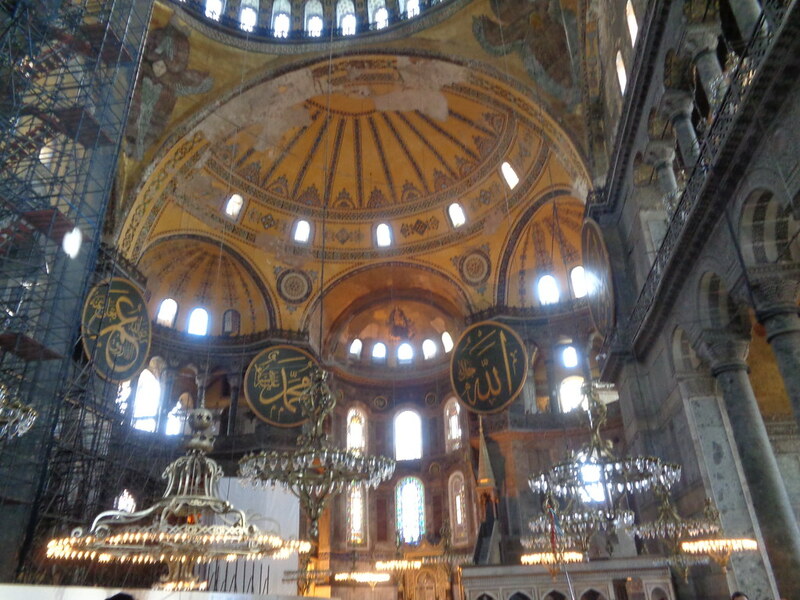 The Hagia Sophia was of course originally built by the Romans, and is full of Eastern Roman mosaics and so forth. 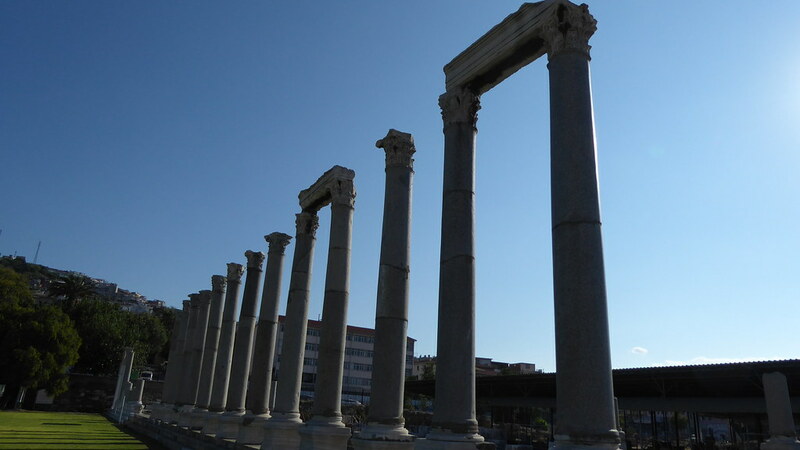 The area immediately outside the Hagia Sophia was, in fact, a Roman hippodrome, an area for racing horses, and it contains several Egyptian obelisks erected there by the Romans. Then there is the Ottoman side of things, with tons of mosques, and all sorts of other elements and aspects. All over the city, we saw shops that date back to Ottoman times, and bits and pieces here and there of historical sites or markers or other things suggesting the history of the Ottomans as one of the world’s great empires, engaged in diplomatic interactions with the Great Powers of the rest of the world. A fountain associated with Kaiser Wilhelm, located in that former hippodrome, is just one of many such sites. I’m told there’s some Japanese building somewhere in the city as well, though I haven’t come across it. The Kılıç Ali Pasha mosque, designed/built in the 1580s by Mimar Sinan, who also designed the Suleiman Mosque and hundreds of other famous structures across Turkey and beyond. 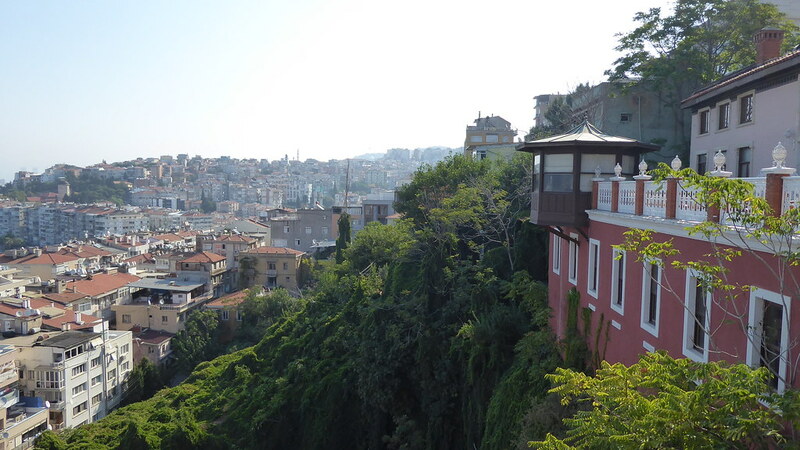 The Ottoman aspect of the city also connects in to the maritime, Mediterranean, aspect. 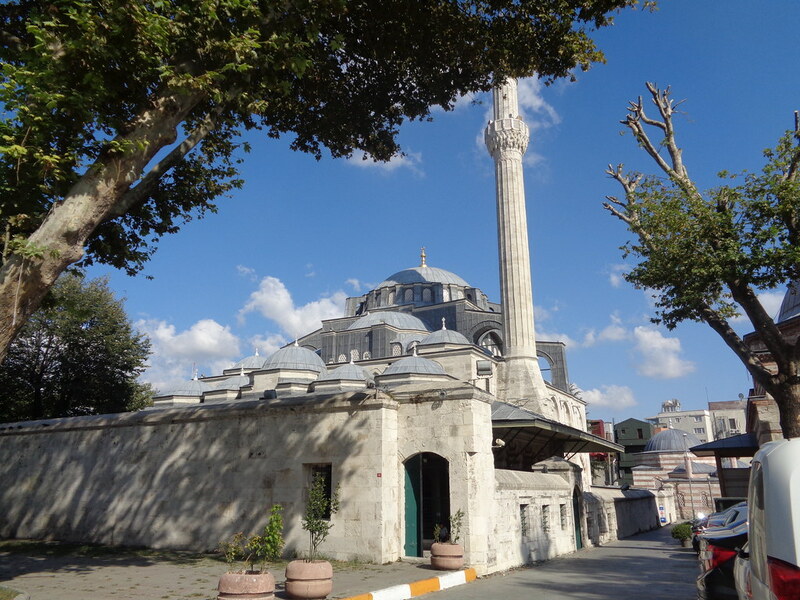 A major mosque we keep passing (as it’s right by one of the main tram stations) is named after Kilic Ali Pasha, a 16th century admiral of the Ottoman navy who was originally from Italy and converted to Islam. The Galata Tower, one of the most iconic sights in the city, was built by the Genoese and while I’m not truly expert at architectural history, it did indeed strike me as Italian from the very beginning. I don’t know all that much, actually, about the history of the Ottoman navy, and its involvement in Renaissance/Early Modern history, but I do know that it’s a very defining feature of the Ottoman faction in the board game Here I Stand, which takes place in the Reformation era. We see, too, numerous restaurants and other elements and aspects here and there throughout the city relating to the immediate post-revolution period, in the 1920s. 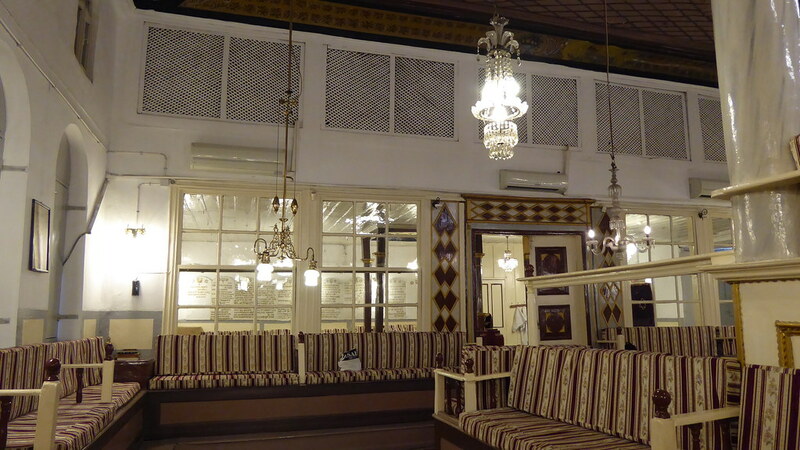 Again, I’m no expert at Turkish history, and I wish I knew better, but just on the surface, this very “modern,” European (yet distinctly Turkish) aesthetic, with the fezes, mustaches, fancy formal dress, and salon-like decor, has a real appeal. 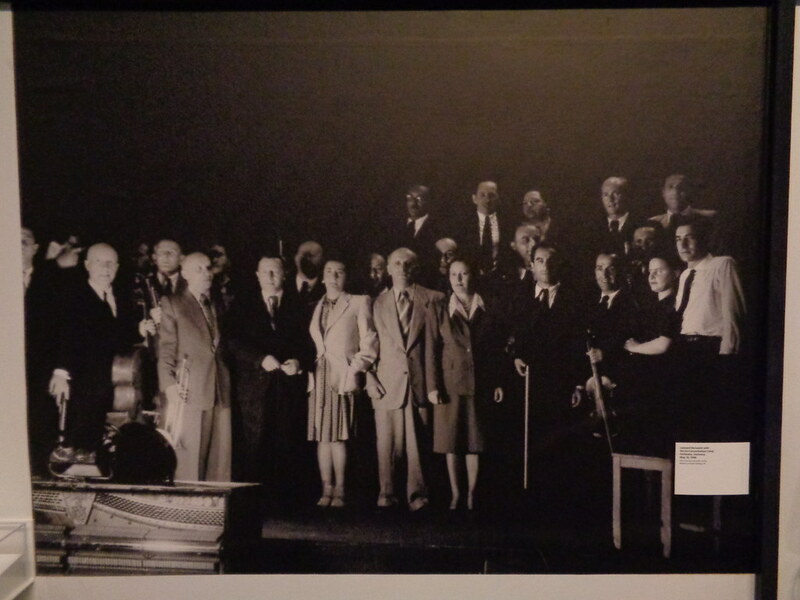 One night, we went to a “tavern,” or meyhane, where live music was playing, and while this place wasn’t explicitly marked or marketed as being 1920s style, there were some old photographs on the walls, and there was a certain something to the decor. 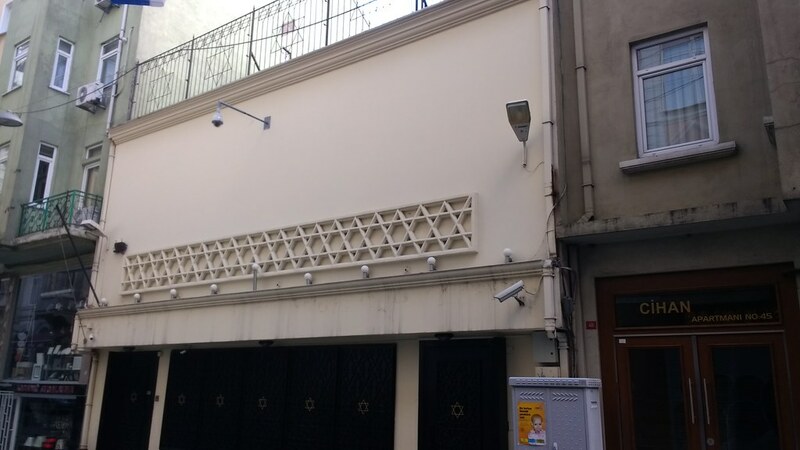 Other restaurants we went to, or simply passed by, were explicitly labeled as Istanbul 1923, or Istanbul 1924, and one restaurant in Istiklal Street (one of the main shopping/tourist areas of the city) is explicitly marketed as being designed to recreate that 1924 atmosphere. 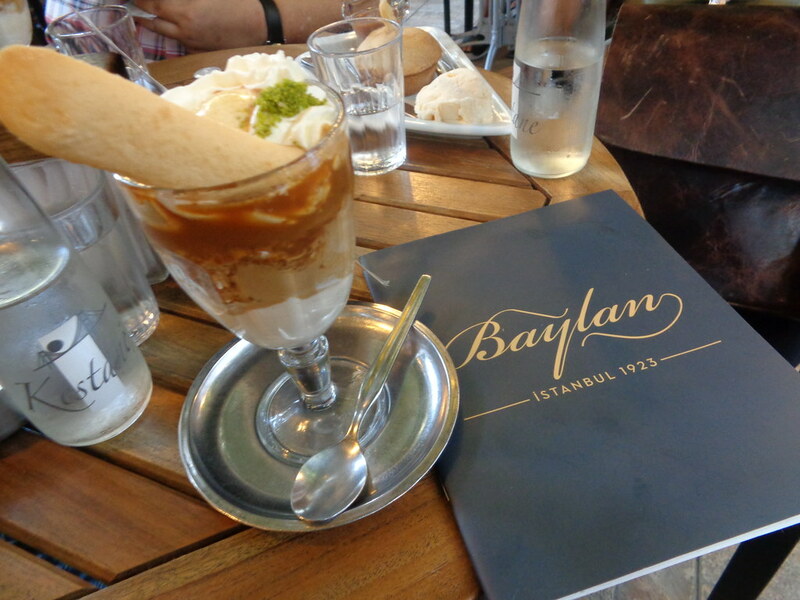 Baylan, a nearly 100-year-old café/bakery on the Asian side (near Kadıköy), long owned by Greeks, and located in a neighborhood where there had once been a strong Armenian community. Finally, there is the contemporary situation. We didn’t see or sense any major political problems or tensions while we were here, thankfully. No protests, no riots, no crackdowns. 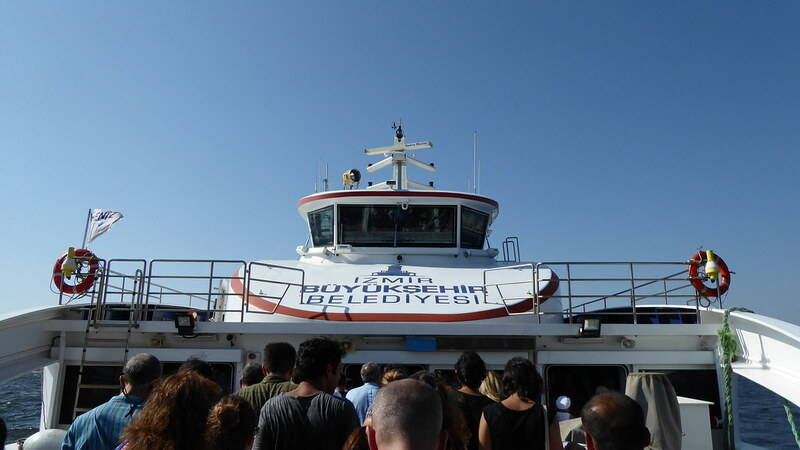 Despite what you might hear about Turkey in the news – and believe me, I am sorely sad and worried about that country, and Ergodan’s ever-increasingly dictatorial and theocratic regime – we did have a fantastic time, and I never felt especially unsafe, nor even all that worried about the authorities. That said, we stayed fairly close to Taksim Square – where major protests took place just a few years ago – and both there and elsewhere we saw some fairly intimidating police or military presences. I also enjoyed learning a little about – and meeting some members of – the lively Jewish community there. 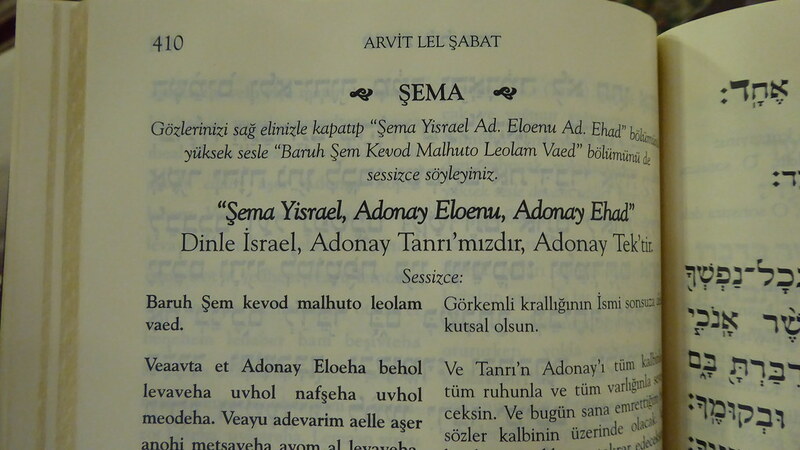 Jews have lived happily and peacefully in Turkey (for the most part, or, to some extent) since the 1490s or so, when Ferdinand & Isabella expelled the Jews of Spain, and the Ottoman Sultan reportedly was happy to take them in. 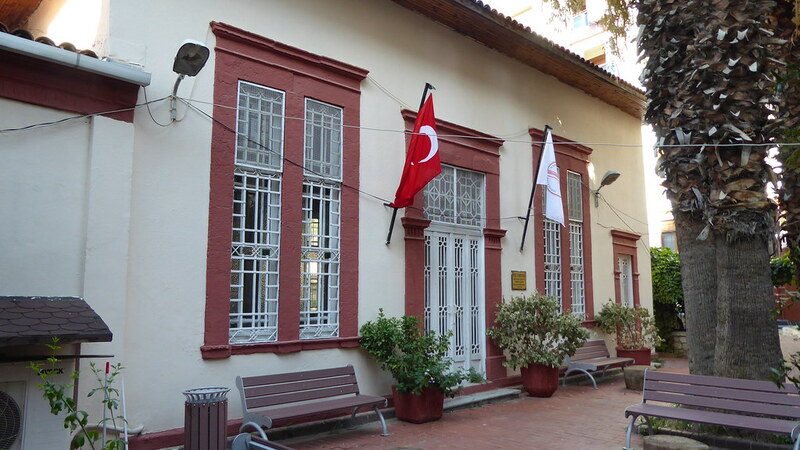 While many Turkish Jews have moved to Israel, the US, or elsewhere in recent years, those we spoke to say they are quite happy, and feel safe; they tried to disavow us of the notion that Turkey was a particularly dangerous or anti-Semitic place to be at all. 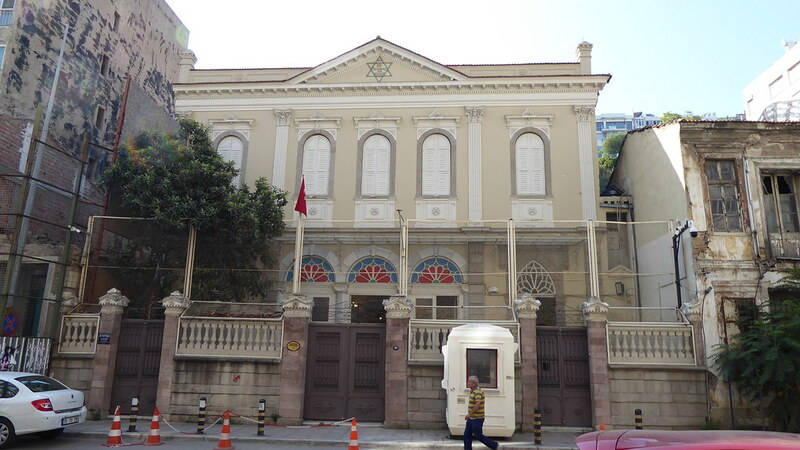 The Neve Shalom synagogue in Istanbul. I was glad to hear this. Still, there were notable protests outside of one of the city’s main synagogues just a couple months ago, which included the throwing of rocks, and violent threats against Jews trying to get into the building. This synagogue, Neve Shalom (“Oasis of Peace”), was attacked in 1986 by the founder of Fatah, who murdered 22 people who had gone there to pray. 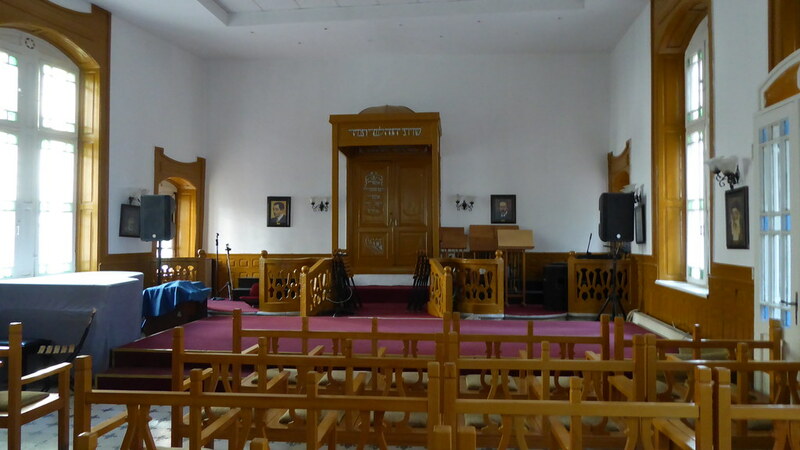 The synagogue was attacked again in 1992, by Hezbollah, and again in 2003, when simultaneous car bombs went off outside Neve Shalom and another synagogue in the city, killing some 23 people. I’ve seen pretty serious security precautions taken at synagogues in London and Tokyo as well. But, still, there is enough of a Jewish community that there remain quite a few active synagogues in the city, which in photos online look gorgeous (we didn’t get a chance to visit any, since they require prior reservation, and some sort of screening process – I’ve been told that even Ashkenazi Jews like myself are not so trusted, not let in as easily as Sephardim). 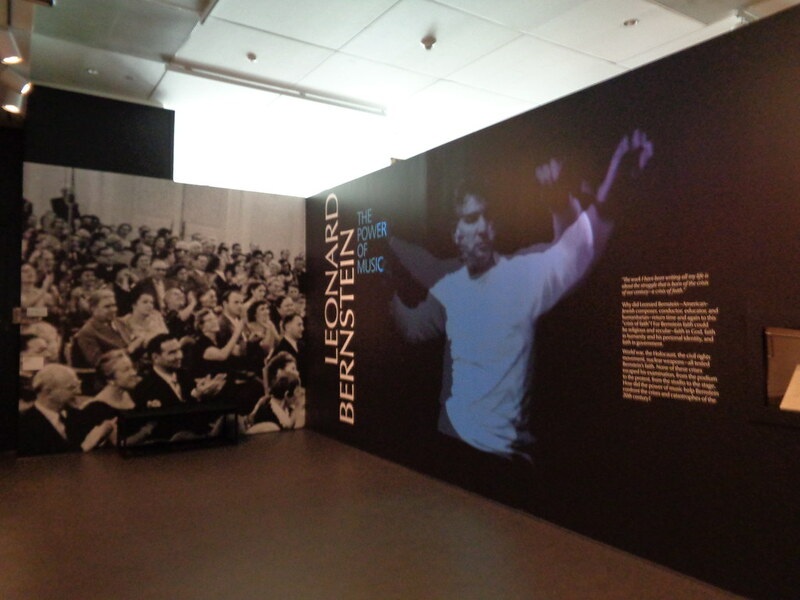 The city is also home to several Jewish music groups, two Jewish newspapers, and so on and so forth. 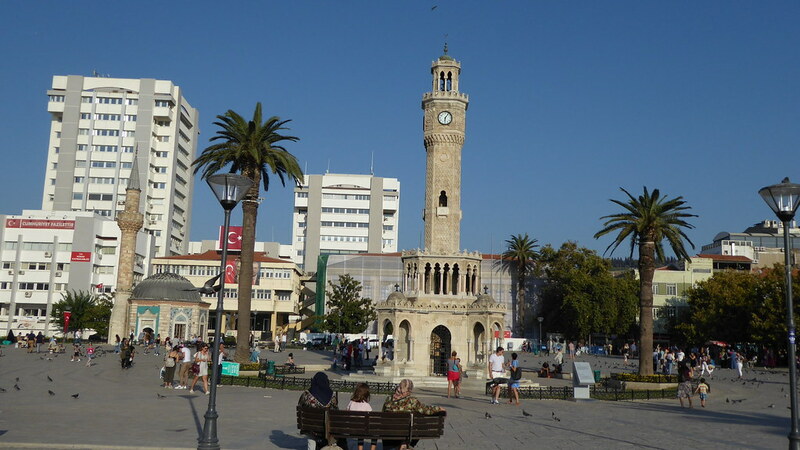 And, they’re not entirely unknown – regular people here seem to have some sense about Turkish Jewry: one, in terms of people saying we look Jewish, and either based solely on our looks or on that we said we speak a little Spanish, they then assume we’re Jewish. One small music group at a small “live house” café even burst into a Turkish fasil-style rendition of Hava Nagila for us! Plus, when we went to the Grand Bazaar, we found lots of tchotchkes, necklaces, etc. 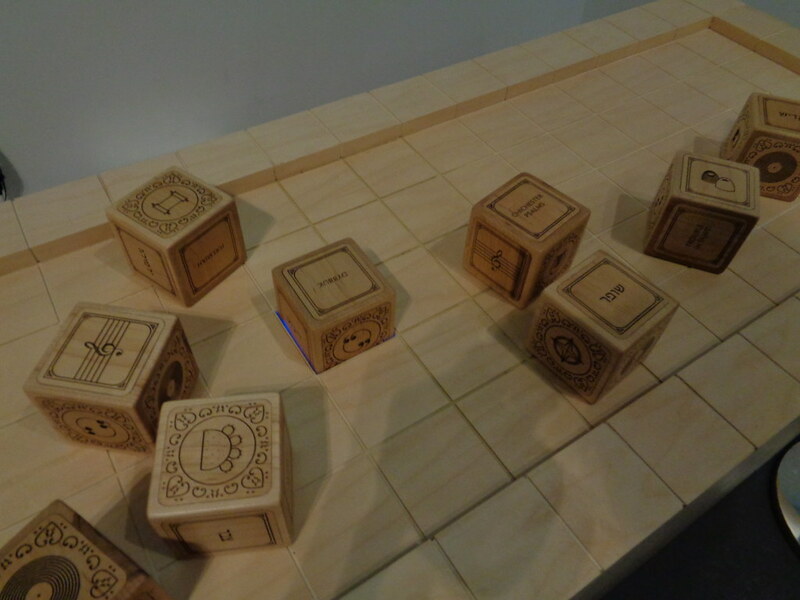 being sold with Stars of David, Hebrew writing, or other Jewish elements. 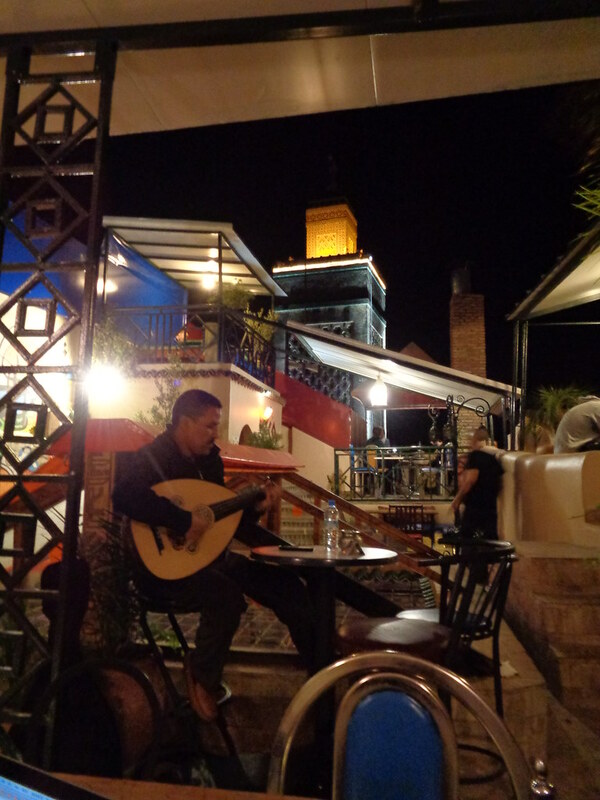 One of the fasil live music bars we went to: Abbas, on Nevizade Sk. The Armenian history is of course another thing, too. Everywhere around there are Armenian churches, or other churches formerly used by the Armenians – and some of these have some serious security precautions like the synagogues. There are of course no historical plaques or anything put up by the city or the state talking about the Armenian Genocide (though we did see a plaque talking about it at an Armenian church in Jaffa), but if you know even the tiniest bit about it, you can imagine, fill in the gaps. My girlfriend also told me about certain events, massacres, in certain neighborhoods in the 1890s, as we walked through those neighborhoods. I don’t know anything about the current contemporary situation in terms of attitudes towards Armenians, or how well they get by in society, but, it’s definitely a history that’s hidden, yet very much present, if you have it in mind. 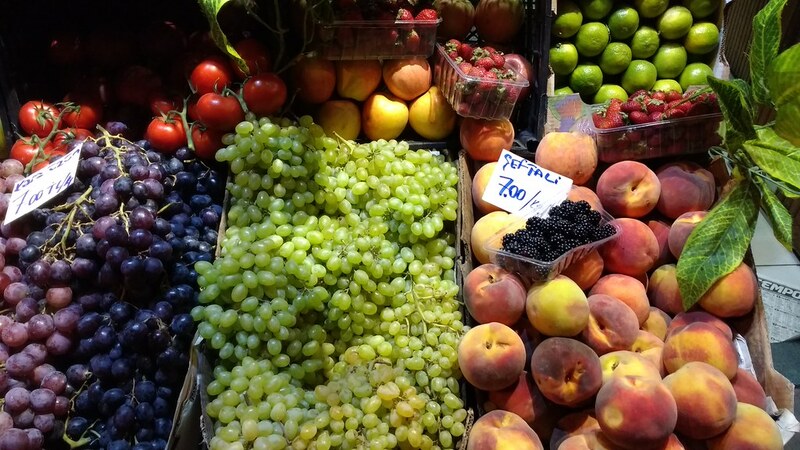 Some lovely fresh produce for sale in Nevizade Sk. For all it’s problems – and we all know the US and Japan have their problems too – Istanbul is a very modern, cosmopolitan, urban, in some ways very European city – really feels cosmopolitan, feels like a “world city” (like New York, London, or Tokyo) with just so much going on – but then of course it’s also non-Western in many ways, first and foremost I suppose because of its Muslim and not Catholic or Protestant religious character – to a certain extent, Istanbul was the very city (or, the Ottoman Empire the very country) against which “the West” or “Westernness” was constructed and defined, even going all the way back to the Eastern Roman Empire, and the Eastern Orthodox Church, which were considered “byzantine” and “Oriental”, and were not considered part of the “true” or “main” or “catholic” Roman or Christian heritage. The music was wonderful, and the food as well. 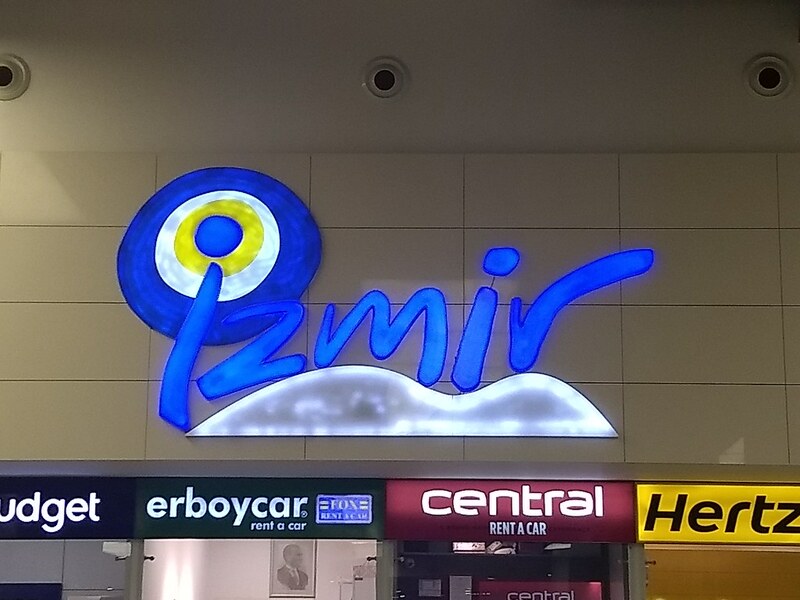 I never understood my girlfriend’s obsession with borek until I came here. 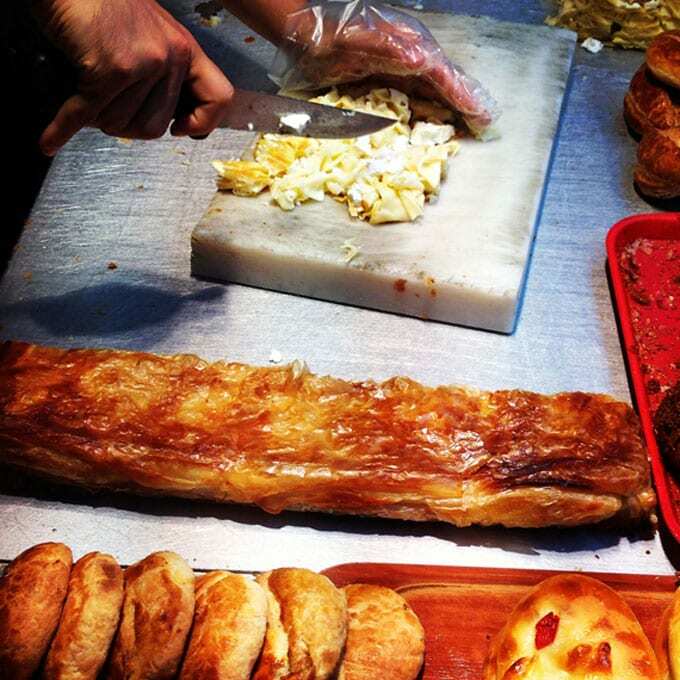 I could eat borek every day. And I so wish that we had this more regularly in the States. In the food and music, as well as in the architecture and history, we see too the many cultural influences that come together in Istanbul. Turkish, Arab, Jewish, Balkan, Circassian (Black Sea/Russian) cultures… all these different cultures, different cultural influences, that for all our talk about “diversity,” we just don’t see/hear/learn that much about in the US. All photos (except the börek) my own. Do Mizrahi Jews count as “People of Color”? Right: A Jewish wedding in Aleppo, Syria, 1914. Public domain image courtesy Wikimedia Commons. Our racial politics, like so much else, is often framed as a dichotomy. Activists seek intersectional solidarity and allyship with all people of color (PoC), a giant category that seems to include everyone under the sun except whites. Or, alternatively, activists address African-American and Hispanic/Latino issues and overlook everyone else. This manifests in the diversity rhetoric of university rhetoric and countless other places, and of course it does so in different ways in different cases – life is complicated, and I wouldn’t want to suggest otherwise. After all, the idea that this is complicated, that diversity and identity are not a dichotomy, not even a spectrum arranged unidirectionally from white to non-white, but rather a complex mess of factors, is key to the topic of this post: do Mizrahi Jews count as “People of Color”? The Forward – one of the oldest and most major Yiddish newspapers in America, now published in English too – had a great opinion piece this past August, written by Sigal Samuel. I really love the nuance and complexity Samuel brings to this issue; the author’s journey, wondering whether she counts as a “person of color,” and getting very different answers from people she speaks to, points to the problematic nature of our dichotomous conceptions of race. Okay, terminology time. Mizrahi Jews are those who themselves, or their relatively recent ancestors, come from the Middle East. The Jews currently fleeing persecution in Syria, Yemen, and Iraq are Mizrahi Jews. They are as Middle Eastern, as non-European, as any (other) Arab. If Ashkenazi Jews – those of Eastern European descent – are arguably to be considered something other than just plain “white,” then surely Mizrahi Jews, and Sephardic Jews – those of Mediterranean heritage, largely descended from those who moved to Italy, Greece, or elsewhere after being kicked out of Spain in 1492 – should count as “people of color” as well, right? But, of course, it’s not that simple. Left: Sigal Samuel. Image from the Forward. Samuel’s piece isn’t very long, so I don’t want to risk writing a blog post about it that repeats the entire thing, or that takes longer than her piece itself, though there are many excellent choice bits. I invite you to go read the whole thing, but, in a nutshell, Samuel writes that she, her family, and many members of her community, based both on their own feelings about their heritage (their self-sense of identity) and on the way they are treated in society, generally feel themselves to be something other than white. And yet, when she asks around, various people – including an African-American Jewish acquaintance and a (presumably Ashkenazi) Jewish professor of Middle Eastern Studies – tell her in no uncertain terms that she is not a person of color, because her people have never experienced such discrimination in the US as Asians and blacks. Further, with Ashkenazi being the dominant type of Jews (at least in a great many communities in the US), and with Ashkenazis having come to be considered white, “Jewish” as a category, as a whole, has likewise come to be considered white, separating Samuel from others of Arab or Indian descent, in many people’s eyes. What I really like about this piece is that it not only illustrates these contradictions, and the failures of our black-white concept of race to accommodate the diversity of real human experience, but that it also highlights the ways in which identity is political. This is not simply about empirical categorizing – coming up with definitive determining factors and categorizing everyone “correctly” according to who they really are, or where they really belong. It is about the personal and political motivations, purposes, and (dis)advantages, in claiming a particular identity. This is why, for example, many Okinawans assert an “indigenous” identity, while Koreans and Tibetans, from rather similar historical circumstances, do not – for political purposes, and because of some sense of cultural affinity with Hawaiians and certain other groups. 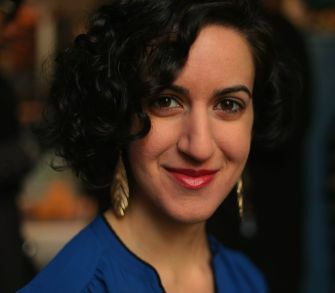 Claiming the Jew of color identity, then, was not only a way to express my authentic feeling of moving through the world as a perpetual Other — it was also an attempt to destabilize [the idea that Jewish = white, and that Jewishness is opposed to Arab identity]. But was that, you know, kosher? Or did that performative aspect give my story some uncomfortable Rachel Dolezal-ish undertones? I love the way this piece highlights the complexities of race and identity. Many people seem to feel quite self-assured and self-righteous in policing who does and does not count, even as their own liberal-progressive discourses emphasize self-determination (see: gender identity, gender pronouns, who counts as indigenous?, who counts as black?). And yet, the world is more complicated than that. People – their experiences, their heritage – are more complicated than that. An image from the 1901-1906 Jewish Encyclopedia, depicting “French Jews.” Public domain image courtesy of Wikimedia Commons. Hila Hershkoviz posted an interesting op-ed/blog post in the Times of Israel recently, arguing that Ashkenazi Jews (i.e. of Eastern European, rather than Mediterranean or Middle Eastern descent) are not white, and should stop self-identifying as such. I’m not sure I agree with everything Hershkoviz says here – in the end, I think the answer is more complicated than a simple white/non-white binary – but it’s certainly interesting to think about. *First, let me begin with two critiques, or critical thoughts. One, while who we self-identify as is important, who others identify us as is equally powerful, if not more so, operating upon our conception of ourselves, and upon our interactions and position in society in different ways, on different planes. Regardless of how I identify, with whatever nuance I might use to describe my own identity to others, so long as others perceive me as “white” in a myriad of everyday interactions and systematic ways, I will benefit from, and be accused of, white privilege. White privilege is real, and I have genuinely benefited from it, both in my socio-economic status, and in how people regard me in everyday interactions. It doesn’t matter if I carry around a copy of Hershkoviz’s article to show people. 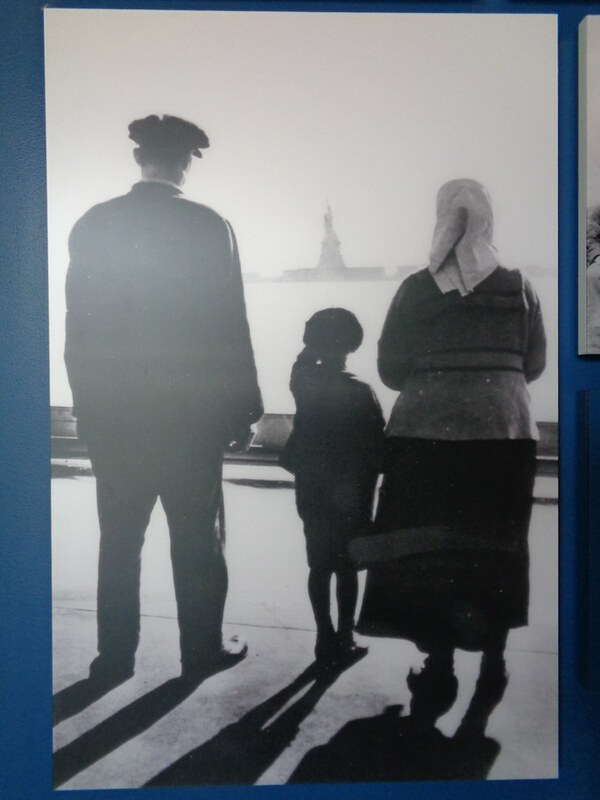 It doesn’t matter – and I say this genuinely, and not sarcastically or by way of complaint – that my grandparents were survivors of one of the worst attempted genocides in world history explicitly because they were not “white.” It doesn’t matter that no one in my family was in the US before 1900, and that I have no direct familial/ancestral ties to any of the whites who were responsible for the worst parts of our country’s history (e.g. seizing of Native American lands, black slavery, etc.). What matters is the fact that I’m here now, and that for three generations, my family has benefited from others perceiving us as white, in everything from bank loans to how we’re treated in the classroom. It doesn’t matter if “white” is an artificial category, which changes over time, and which cannot necessarily be too easily defined. This has real impacts in our society. Even if I’m not “really” white, as articulated by Hershkoviz, for all intents and purposes in our racialized society, I might as well be; or, to put it another way, since race is socially constructed, so long as society sees me as white, I /am/ white – that is the identity category that society places me in. Two, Hershkoviz’s assertions about who we really are as Jews, compelling though these narratives may be, are ultimately problematic. Identity is constructed and constantly being renegotiated. It’s tempting to want to look back across centuries or even millenia of history and think, this is who we are, this is who we have always been. To think that we are a “tribe,” as Hershkoviz asserts, following certain ideas of identity and membership millenia old. But is Hershkoviz’s idea of tribal identity, what it means and how it works, only a 21st century idea? Would the Zionists of pre-1948 Palestine have agreed? Would Herzl? How would Maimonides describe his identity, in terms of religion, ethnicity, nation, or tribe? Seven, eight hundred years ago, the dominant idea in Western Europe as to identity was not race, ethnicity, or nationality, but religion. Europe was “Christendom,” more so than it was anything else, and while the Europeans certainly also saw themselves as Franks, and the Muslims as “Turks,” “Saracens,” or by a variety of other names which might be said to be ethnic identifiers, the dominant worldview was still one of religious spheres, not one of nations or ethnicities. A few hundred years later, even as national identities (e.g. French, Dutch, English, Spanish) began to emerge more solidly, identity as part of the Catholic world or of the Prostestant world, remained extremely powerful. Today, there are countless groups around the world reimagining, reasserting, their identities in various ways – indigenous groups, new nation-states… In short, how we identify – and what the relevant categories are – changes over time. 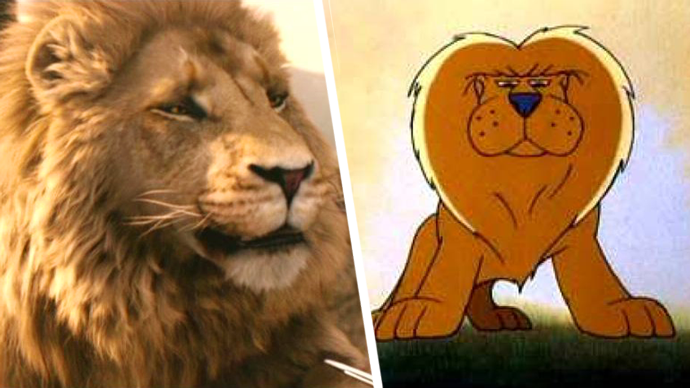 In all times, we assert that our identities are true, stretching back centuries. But in all times, these identities are constructed more by the needs, and the terminologies, of a given time, than by the past. Just as Japanese look to defeat in World War II and the subsequent turn to pacifism of their nation, among many other things, as key to how they define their identity today; just as the Hawaiians look to the overthrow of their kingdom and the current illegal US occupation of their land as fundamental to their identity; so too do we as 21st century Jews look to the Holocaust, the state of Israel, worldwide anti-Semitism, and our personal or familial experiences of immigration and diaspora, for our constructions of identity, and we shouldn’t pretend otherwise – we shouldn’t pretend that our identity as Jews is just as it has always been, stretching back unaltered, as if none of these more recent events/experiences, nor the needs & desires of our contemporary political situation, have any impact. That said, I think there are a lot of intriguing and thought-provoking aspects of this article. *I find Hershkoviz’ idea that we need to “decolonize our minds” intriguing. Like Okinawans raised in the Japanese education system (I know it’s an odd example to choose, but it’s one I know better than most), we Ashkenazi Jews are similarly raised in the US (and I would imagine the same goes in Western Europe and many other places, with variation) to think of England, and to only a slightly lesser degree France, Spain, Italy, Holland, and Germany, as the source of our heritage. Now, granted, there is an argument to be made that the United States /is/ founded upon Western European ideas and culture, that that is the majority culture into which we have assimilated, and that it is a major part of who we are as Americans regardless of where we come from – and that while you get your American education in public school (and from peers, media, and so on), you can still get your Jewish identity, heritage, and education from your parents, and from synagogue, Hebrew school, etc. I imagine much the same could be said for Vietnamese-, Indian-, and African-Americans, not to mention just about everyone else – even the Irish- and Italian-Americans get some different identity from their parents, church, etc. in addition to and separate from the public education “American” identity. But, at the same time, I think there’s something valuable and interesting in the idea that we need to remind ourselves that we do indeed come from a different heritage, that we are immigrants to this land, and that in a sense, really, we Eastern European Jews, descendants of Kiev, Lvov, and Krakow, have no more connection to the heritage of London, Paris, and Rome than do the Asian-Americans. I have no doubt that the latter have no trouble understanding this. *Identity and history is complex, and this issue of us being not a religion, not a race, but a Tribe, and having particular ideas of identity and membership as a result, brings up a much broader issue – broader beyond the topic of the Jewish people – which is that in our ever-increasingly globalized world, how much else has been homogenized into global/modern conceptions and categories? How much cultural diversity has been erased by those categories, even as we use those categories to celebrate diversity? We take it for granted today that the hundreds of national flags represent a great diversity of nations in our world. But where does the idea that a nation must have a flag, and that it must be rectangular, come from? What about all the many traditions and histories in which national identity was expressed otherwise? Here too we have homogeneity masquerading as diversity. There are thousands of languages on this planet, hundreds of countries. Does everyone, from the French to the Saudis to the Hawaiians, from the Catholics to the Sikhs to the Quechua, have the same ideas of what it means to be(long to) a religion, a nation, an ethnicity? Surely we Jews are not the only people who assert an identity that does not neatly fall into the global/modern categories of religion, race, ethnicity, nationality. 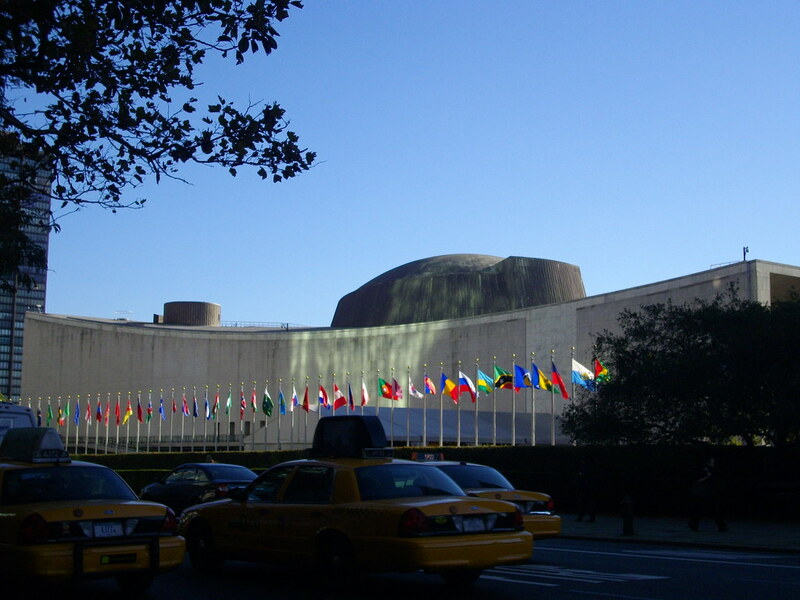 Of course, there is a need for globally agreed-upon notions, to a certain extent, for the sake of passports and treaties and national representation in the UN, census statistics, and all sorts of things. But, imagine if we more consciously and explicitly acknowledged a wider diversity of ways of thinking about identity, and didn’t insist to other people that their own identity categories don’t make sense, or aren’t real. Imagine if we didn’t force all people all around the world to conform to /our/ conceptions of how identity works. What a world that would be. Flags at the United Nations, New York. Photo my own.